According to their findings, not one metal has an "exemplary" substitute for all of its major uses. And for a dozen metals, potential substitutes for each of their primary uses are either inadequate or do not exist at all, according to the study, published Dec. 2 in the Proceedings of the National Academy of Sciences. "We all like our gadgets; we all like our smart phones. But in 20 or 30 years, will we still have access to all the elements necessary to provide the particular functions that make a smart phone so great?" said Barbara Reck, a research scientist at F&ES and co-author of the study. "Based on our findings, it is unlikely that substitution can solve the supply restrictions for any of the metals on the periodic table." The study represents the Yale group's latest attempt to assess the "criticality" of the planet's metal resources—defined by the importance of the elements' uses and their availability—in the face of rising global demand and the increasing complexity of modern products. For the new study, the team compiled a list of the major uses for all metals, the proportion of the metals attributed to those uses, and the best substitute materials—if they exist—based on a review of existing literature and interviews with materials scientists, consultancies, and product designers. The researchers then characterized the performance of those substitutes, assigning a numerical rating corresponding to "exemplary," "good," "adequate" or "poor." 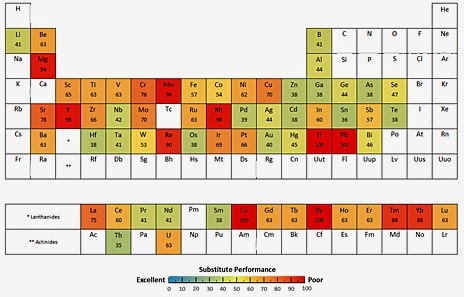 They then compiled a color-coded periodic table highlighting the substitutability of each metal based on those scores. While many of the findings were predictable, some results surprised the researchers. For example, for some widely used metals—including copper, chromium, manganese, and lead—no good substitutes exist for their major uses. "We expected that at least a few of them would be completely substitutable," said Ermelinda Harper, an associate research scientist at F&ES and co-author of the study. "Specialty metals are being used more and more for new technologies such as solar energy systems," Harper said. "As we employ these new technologies, it's really important that we think about what metals are employed, and whether there will be a stable supply of them." "We hope by demonstrating that substitution is not as straightforward as one may think we can stimulate a discussion on the broader implications," said Reck. "For example, if we want to secure the future supply of these specialty metals, we need to do a better job recycling them. This requires efforts at many different levels, from product design, to waste collection and separation, to recycling technology."